Warning: This post talks about the loss of a rabbit. 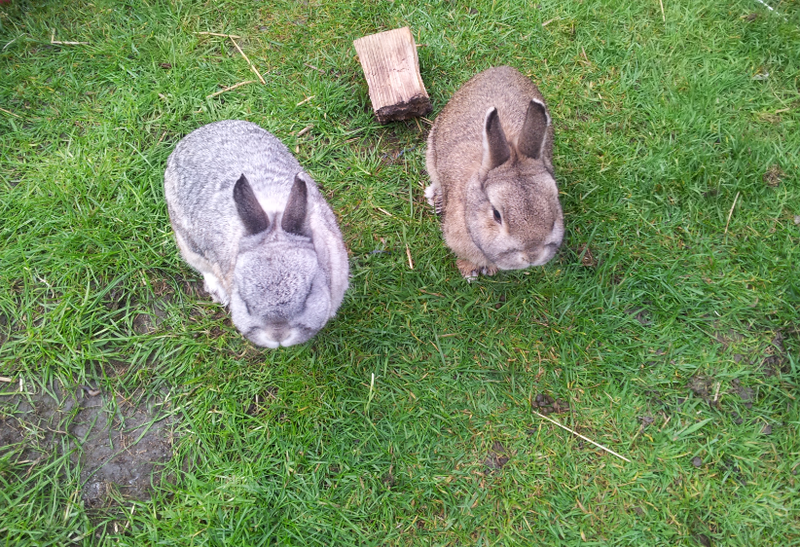 Both rabbits were born in March 2005, so we are unsure what to do about Sebastian, whether to find him a new life-partner or not, because he probably doesn’t have many years left to live, and, if we are getting him a new partner, whether a rabbit or whether a different species of pet would be better. It’s a difficult question for a bunny of such a big age – celebrating his tenth birthday in March – and one we are going to think about very deeply before we make a decision. 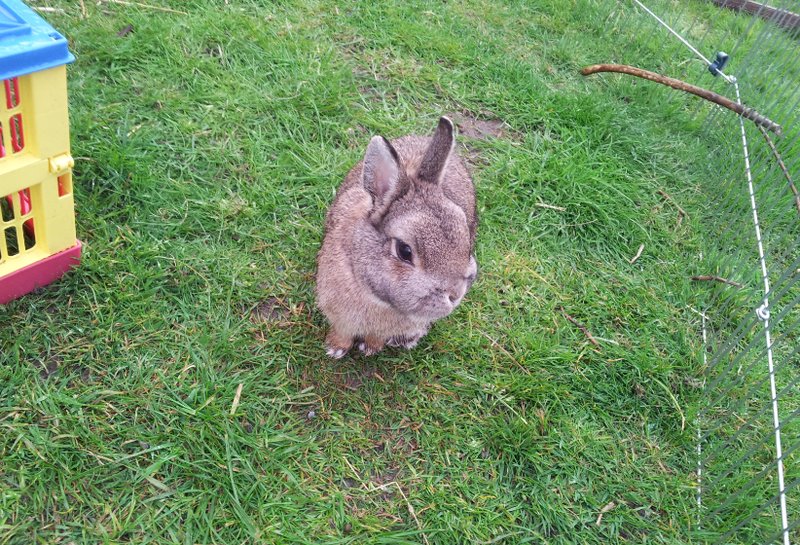 Neville, our little Netherland Dwarf bunny. Whatever we decide, we will continue to do our best to make Sebastian feel better. We are going to have a little burial for Neville tomorrow in the flowerbed, and get a little stone bunny statuette thingy from Homebase or some other garden centre, to put on his grave, so we can always know he is there. We are very lucky that we own our own home and can do such things without any landlord getting snotty about it. I am going to plant some lavender on top so we can see the circle of life taking place as time goes on. 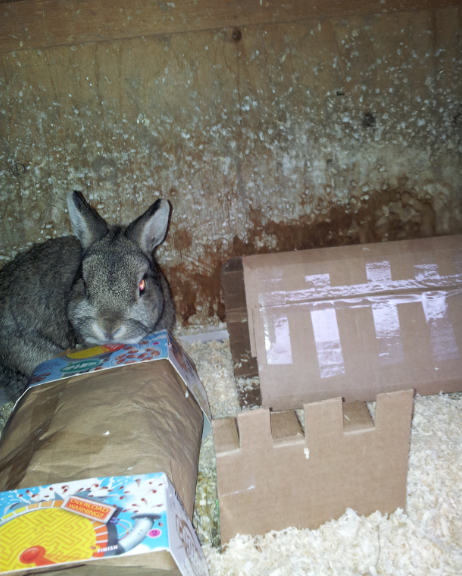 Neville playing in his new bunny castle cardboard toys last November. One thing that the houserabbit society says very clearly about bereaved rabbits is to let the bereaved rabbit spend time with the body of the deceased one. We don’t know how long Neville had been gone by the time we found him (he had been fine the night before when we fed him) but when I pulled him out of the corner of the hutch, rigor mortis had set in and the chest cavity had already depressed (sorry! Archaeology graduate! We deal with dead things). I gave him a thorough examination, I listened for a heartbeat and tried to check if he was breathing at all (he was very stiff but I just wanted to make sure it wasn’t paralysis), and I think he died of old age because he was showing no signs of illness or injury, he was nearly ten and the average age for a rabbit to live to is between five and seven, and outdoor rabbits don’t live as long as indoor rabbits, and winter is a time when organisms are more likely to die than other times of the year. I left him out on the ground for Sebastian to see, just to definitely make sure that Sebastian had had a chance to comprehend what had happened. Then I put him in the other run because Fifer and Katie were very stressed and I don’t think they had quite known why they were so stressed. Katie had a little snuffle. Fifer went nuts and started trying to scratch and bite Neville’s body, which really horrified me, so I pulled Fifer off him and put Fifer a few feet away. Sebastian (left) and Neville (right) hanging out together. I have researched this since, and found out this is actually a normal reaction that some rabbits have when they are confronted with the loss of a friend. Fifer and Neville had a complicated past, but generally in recent months had been snuffling each other through the bars of their runs, and Neville (as you can see digging in my video) was always trying to burrow into Fifer’s run to be near him. Apparently some rabbits do get very angry and become rage-filled balls of hate for a little while after a death. Like people, all rabbits deal with death differently (and differently to people, too – some rabbits get very energetic and start running and bouncing around when they find their friend to be dead, not because they are happy, but because they are just reacting to the loss differently). 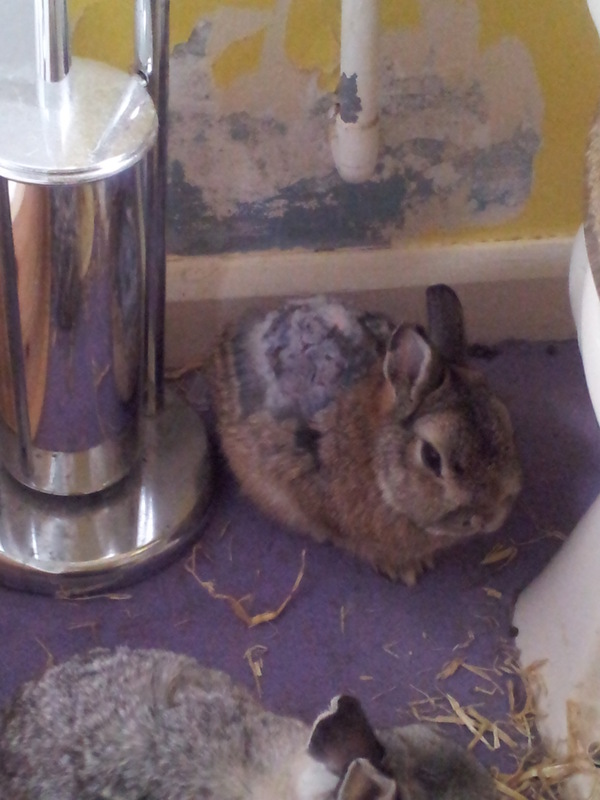 Neville in September 2014, being kept indoors after a difficult time at the vets following a very nasty fight with Fifer. Sebastian is just visible at the bottom of the picture. 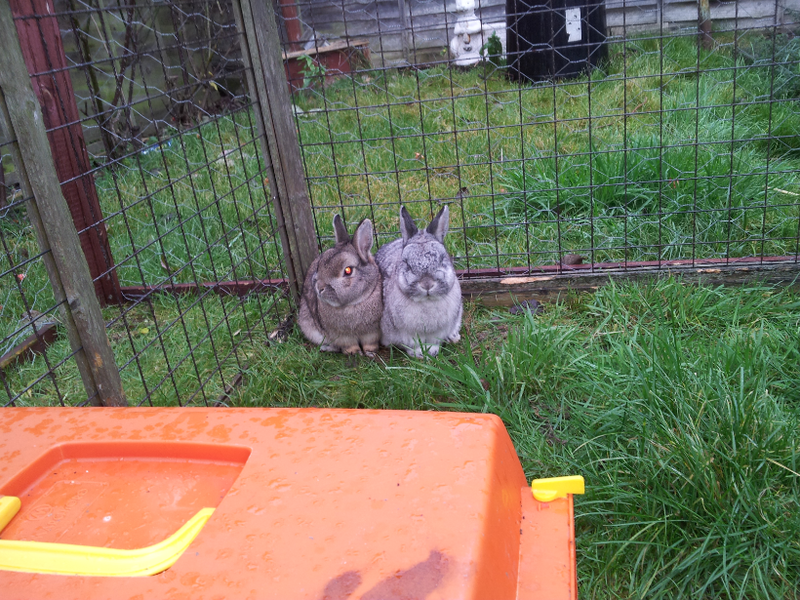 We had to keep them separated though because when they were face-to-face without a rabbit run between them, they always fought with each other. Fifer is still very upset that his arch-nemesis is no more. Katie, his life-partner, is now comforting him. She did also do a very peculiar thing while I was distracted with Fifer – she somehow got into Sebastian and Neville’s hutch and ran through it, around the run and was well on her way to Sebastian when my other half sensibly grabbed her and popped her back onto her side of the run. I think she had the best intentions and probably wanted to comfort Sebastian, but she’s three times bigger than him and significantly stronger, and we couldn’t take the chance that she wasn’t going to accidentally hurt him. A vet visit with a bereaved bunny is the worst thing you can ever hope for, because in the bereaved state they need stability and continuity of people and place. Sebastian and Neville snuggled together in the summer. I have bagged Neville up and put his little body in one of the outhouses overnight just to keep him safe until we return him to the earth tomorrow. 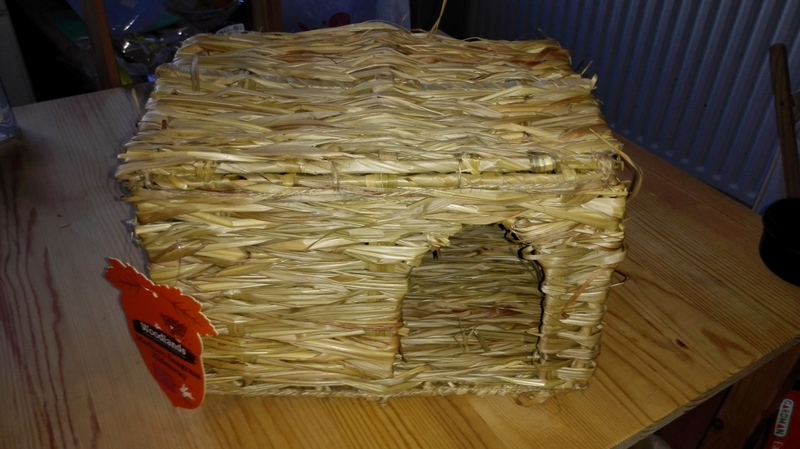 We had gone to pets at home on Sunday and I’d bought a new toy for Sebastian and Neville, a little grass or wicker playhouse, just like the one that the indoor bunnies had demolished (that I talked about in a different post). I bought it against my better judgement even though I didn’t have much money, I just got this strong feeling that they needed a new toy right there and then, and when I put it inside their hutch, they were both so happy that Neville just disappeared into the new toy and had so much fun, and Sebastian was chinning it and nibbling it straight away as well. I am really glad that Neville’s last week was a happy one with lots of fun and that I bought him that toy and that he was able to play with his brother Sebastian in his final days on Earth – I don’t really have any particular beliefs about afterlives and things, something which I struggle to comprehend, but I hope he is happy, wherever he is, and that there are lots of carrots and parsley for him to nibble, and that the earth is soft enough for him to dig in. The new toy before I put it in their hutch. I was hoping to get some pictures of them playing with it this weekend but sadly that will not happen now. We will miss you a lot, little Neville.